LightPointe announces limited-time lower pricing on its AireLink 60 10Gig radios. V-Band radios (60 GHz) deliver high-speed, low-latency, full-duplex wireless transmission license-free. Such radios can be less expensive and easier to deploy than licensed 70 GHz, 80 GHz, and 90 GHz V-Band radios. San Diego, CA, January 16, 2019 --(PR.com)-- LightPointe, a manufacturer of Gigabit capacity outdoor point-to-point radios since 1998 used to connect buildings and towers, announced limited-time lower pricing on its AireLink 60 10Gig radios. The announcement came at the recent Consumer Electronics Show (CES) in Las Vegas, Nevada. The AireLink 60 10Gig is LightPointe’s latest backhaul radio which uses the license-free 60 GHz frequency spectrum. It can be deployed in most countries without applying for regulatory licenses or paying annual spectrum fees, which not only saves money but also speeds the ability to deploy such solutions quickly. Such point-to-point radios can be used as a primary data transmission connection - instead of trenching for fiber and damaging infrastructure - or be deployed as a redundant or backup connection to keep networks operating when leased line and fiber services are down. The average cost of such network downtime is over $7,000 per minute, which means that an organization can justify and pay for a 60 GHz radio deployment by avoiding even one network downtime event. Fiber-like long distance building connectivity for schools, businesses, government buildings, and hospitals - without trenching/installing fiber or the recurring costs of leased-line alternatives. 5G LTE macro and small cell mobile backhaul. WISP (Wireless Internet Service Providers) and ISPs (Internet Service Providers). Disaster recovery and emergency communications restoration. Digital video and security camera connectivity. Remote storage access (data warehouses). Local Area Network extension (wireless LAN). Military theater of operations and base connectivity. V-Band radios (60 GHz) deliver high-speed, low-latency, full-duplex wireless transmission license-free. Such radios can be less expensive and easier to deploy than licensed 70 GHz, 80 GHz, and 90 GHz V-Band radios. Highly secure private network transmission to ensure data protection and prevent cyber security issues typical of internet/public networks. Affordable (under US$10,000), providing the lowest cost per bit and excellent ROI. 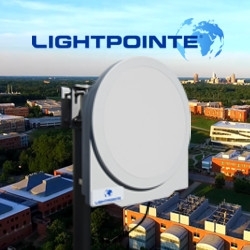 LightPointe (www.LightPointe.com) is a San Diego-based manufacturer of 60 GHz and 80 GHz backhaul radio solutions, which compete against brands such as Ubiquiti, Siklu, Bridgewave, Aviat, SIAE, and Ceragon in the enterprise and 5G LTE market. Click here to view the list of recent Press Releases from LightPointe Communications, Inc.